Have you ever heard that statement from a driver in Toronto, and felt your gut wretch in response? Perhaps you agree with the sentiment. After all, 56 per cent of Torontonians support licensing of cyclists, according to a Forum Research Poll in June. To some people, cyclists appear to use Toronto’s roads for free. For drivers who pay an average of $9,000 a year for gas, insurance, licensing, tickets, registration, maintenance, repairs, and so on, this arrangement might seem unfair. But are Toronto’s cyclists really freeloaders? 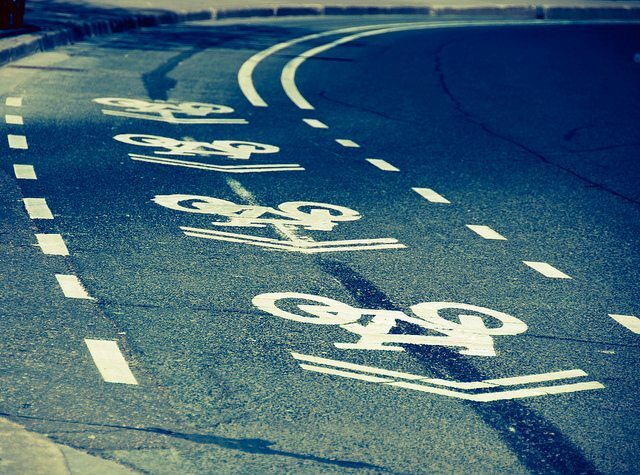 Are drivers undergoing severe hardship and bearing the brunt of the costs of maintaining our streets while cyclists cruise along without paying a dime? Photo by Kiril Strax from the Torontoist Flickr Pool. First of all, it is worth acknowledging that drivers do pay road user fees from which cyclists are exempt (unless they also own a car, which is not unlikely), including licensing, registration, and gas taxes. The revenue from these fees goes to the provincial and federal governments for transportation initiatives, with some of it being allocated back to cities for use on transportation projects. In Toronto, this funding is actually invested into the TTC’s capital budget. So while driver user fees do help pay for transit investments, they don’t in fact pay for road maintenance and construction costs. Every year, as part of the City’s budgeting process, the Transportation Services department releases its one-year operating budget and 10-year capital budget. The operating budget pays for staffing costs and basic operations such as pothole filling and snow removal, while the capital budget is used for road and sidewalk projects and construction, including big ticket items like the $2.3-billion Gardiner Expressway rehabilitation and the recently-approved $160-million Cycling Network Ten-Year Plan. Transportation Services, like all City divisions, relies on different sources of funding for the operating and capital budgets. The largest funding source for the operating budget is property taxes, a revenue source that is paid for by all residents, regardless of home ownership (tenants’ taxes are reflected in their rent) and transportation choices. Similarly, the capital budget is nearly two-thirds paid for by a combination of debt and “capital from current”—essentially a transfer of funds from the operating budget, which again is mostly funded by property taxes. Everyone funds the upkeep and maintenance of roads, regardless of use. Photo by Mike Scott from the Torontoist Flickr Pool. When deciding how to allocate its spending, any financially prudent government should be concerned about maximizing the returns on its investments to achieve policy goals. When it comes to the City of Toronto allocating transportation dollars, the same principles apply. 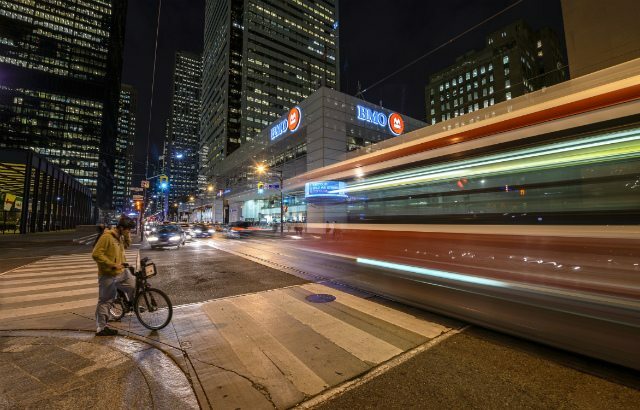 For example, when deciding whether to invest in a particular transit project, governments must consider the benefits in terms of travel time savings, emissions reductions, and more, and weigh them against the construction and maintenance costs over time. Fortunately for cyclists, the business case for cycling infrastructure is strong. A 2012 study by the City of Copenhagen found that for each additional kilometre traveled by bike, a social gain of DKK 1.22 ($0.24 CAD) is achieved. By contrast, each additional kilometre traveled by car leads to a social loss of DKK 1.13 ($0.22). Every financially prudent citizen likes to see a city spending money on things that will actually deliver positive returns, and when you run the numbers for cycling investments with these figures, they look pretty darn good. Toronto actually has had a pretty solid track record recently of attracting new cyclists with new investments, and for a city concerned about decreasing traffic congestion, that’s a good thing. Take the Richmond-Adelaide cycle track pilot for example: in just one year, the installation of new, protected infrastructure on these streets resulted in a 200 per cent increase in daily cycling trips, without negatively impacting car travel times. All for the cost of paint and bollards. The freshly launched bike lane pilot project on Bloor Street aims to achieve similar positive results, by adding parking-protected bike lanes along a 2.7-kilometre stretch of Bloor Street at a cost of $500,000. Based on the Danish figures mentioned above, if the project generates just 1,100 new daily bike trips, it will break even (by comparison, the new cycling tracks on Richmond and Adelaide led to over 2,000 new daily cycling trips). Toronto will measure a lot more data and analytics from this pilot project, and that should inform future cycling infrastructure decisions. In case you got lost in the numbers, let’s recap. Car drivers in Toronto pay road user fees, while cyclists do not. Those user fees are in turn used to fund transit projects. What actually pays for roads are property taxes and new city debt, two costs that are paid by all residents, regardless of their transportation choices. Finally, investing in cycling infrastructure actually delivers major value to cities, and local investments have shown significant success right here in Toronto. So next time someone makes a point about how freeloading cyclists need to start paying for the roads they use, perhaps it’s worth mentioning to him or her that as a cyclist everyone shares in the costs already, and we can instead focus on what moves the most people efficiently.